Drums, Percussions / Tabla / Vocals / Beatbox. Canadian born and raised, Satnam Ramgotra is a drummer/percussionist blending traditional drum set with Indian, African, and World Percussion elements into modern musical environments. His formal training on both drum set and Indian Classical Tabla started at the age of ten. Throughout his school years, Satnam performed and competed in regional and national band festivals across Canada, where he was repeatedly singled out and received many awards for his talents. 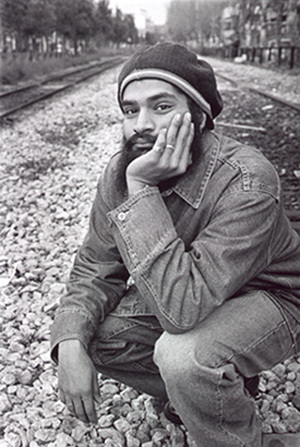 Satnam later relocated to California to further his musical ambitions at the renowned Percussion Institute of Technology, and soon thereafter began performing live and recording with many of his instructors. Studying the Tabla under renowned Tabla maestro, Pandit Swapan Chaudhuri, Satnam expanded his experience with percussion to include frame drums, African percussion, dumbek, congas, and 'tinkertoys' Playing with the legendary Ustad Salamat Ali Khan helped Satnam refine his tabla stylings. Satnam has performed as a guest artist, and toured with world-renowned artists in the past sixteen years, including Nikka Costa, Beck, Sting, Seal, Lili Haydn, Steve Vai, Jada Pinkett-Smith & Wicked Wisdom, and Ustad Shafquat Ali Khan. He has recorded with Macy Gray, The Calling, Plastilina Mosh, Lee Ritenour, Carmen Rizzo, Niyaz, Michael Brook, the late Kevin Gilbert, Bitter:Sweet, Wayne Jones, Carl Stevenson, POE, Torrell Ruffin, FreakJuice, Danny Peck, Lamya, Michael Landau, Dionesis Savvoupolos, Donna Delory, Slapbak, Rick Boston, Nikos Kippergos, David Lynch, Peter Himmelman, Harold Kloser, Jeff Rona, Haddaway, Martin Tillman, and Geoff Emmerick. Satnam's credits also include TV's "The Tonight Show with Jay Leno", "The Late Late Show" with Craig Ferguson, the "Rosie O' Donnell Show", "CBS Morning Show", "Late World with Zack", The Radio Music Awards (2001), “The Wayne Brady Show”, "M.D"s (ABC/Disney), and BBC's "Top of the Pops". In addition, Satnam regularly works with Hollywood’s “A-list” film composer’s; Hans Zimmer, James Newton-Howard, John Powell, Aaron Zigman, Atli Orvarsson, and Alberto Iglesias. His Motion Picture Film credits include; “Hancock”, "Black Hawk Down", "John Q", "Zoolander", "Matchstick Men", “Kite Runner”, “Charlie Wilson’s War”, “Vantage Point”, “Babylon A.D.”, A Bridge to Terebithia”, “The Burning Plain”, “Madagascar 2”, “The Dark Knight”, “Monsters vs Aliens”, and most recently, “Angels & Demons”..
2007 and 2008, Satnam appeared at the Hollywood Bowl for the 40th anniversary of the Beatles' Sgt. Pepper's Lonely Hearts Club Band Album with legendary Cheap Trick, accompanied by the Hollywood Bowl Orchestra. Satnam has also significant international clinic & teaching experience at Poly-Rhythmos School of Music (Athens, Greece), The Jazz School of Luzerne (Luzerne, Switzerland), Sikh Society of Saskatoon (Saskatoon, Canada), and the Musicians Institute (Hollywood, CA), in addition to teaching drums and tabla locally, as time permits.